Convenience coupled with a touch of luxury makes Mountain Lodge Telluride the perfect choice for your winter holiday. Telluride, Colorado was first established as a gold mining town in 1878 but went on to become a luxury winter destination. The town has a rich history including the fact that Butch Cassidy’s first major crime took place at the San Miguel Valley Bank in Telluride, where he stole $24,580. This history makes Telluride one of the most interesting resorts in Colorado. The Mountain Lodge offers a variety of accommodation types, including many units with split King beds, ideal for those clubs with a lot of single members. All units are either suites or condos with full kitchens, fireplace, and balcony. Complimentary fiber-optic wireless internet is standard in all units. The ski-in, ski-out location makes it the perfect place to stay with a group when you want to get as much slope time in as possible, while having somewhere warm and welcoming to come back to. You can unwind after a hard day’s skiing with a soak in one of our outdoor hot tubs or a cocktail in The View. There also are suites and rooms within the lodge itself. The suites are equipped with their own kitchen and can sleep up to six people, so they’re perfect for smaller groups. 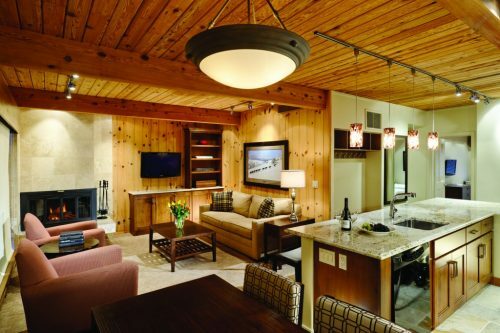 Lodge amenities include grocery shopping service, on-site ski rentals, ski lockers, indoor and outdoor heated pools, hot tubs, a fitness center, a massage room, a steam room and full bar and restaurant, The View. Whether you’re dining or just grabbing a cocktail at The View, you can gaze out the 50-foot ceiling-to-floor windows overlooking the mountain range. During the winter, The View is open for breakfast, après-ski and dinner. Catering services are available for groups and families. How do I get to Mountain Lodge Telluride? Telluride’s location makes it surprisingly easy to get to. There are numerous flights directly into the Montrose/Telluride Regional Airport from around the country. Once you have arrived at the airport it is a scenic drive through some of the best mountain scenery in Colorado. 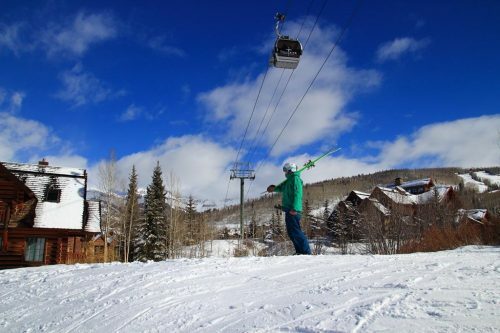 One of the most unique characteristics of Telluride is the free Gondola system transporting guests from the Mountain Village to the town of Telluride. The beginning of the gondola is next door to the Mountain Lodge with a short 30 second shuttle ride on the Mountain Lodge free shuttle, extremely convenient for our guests. The 16 minute ride gives you the opportunity to experience the stunning beauty of the San Juan Mountains. What is there to do off the slopes? In addition to snowboarding, downhill skiing and cross-country skiing, there’s a lot to do on a Telluride vacation. The nearby Nordic Center is a great place to start as it offers ice skate rentals, or you could go on a ski or snowshoe tour of the surrounding area. If you’re visiting Telluride with your family, a sleigh ride would go down brilliantly. It’s a great way to see the area and take in the scenery while observing some beautiful animals. If you’re feeling more adventurous, why not go on a group horseback ride through the snow. 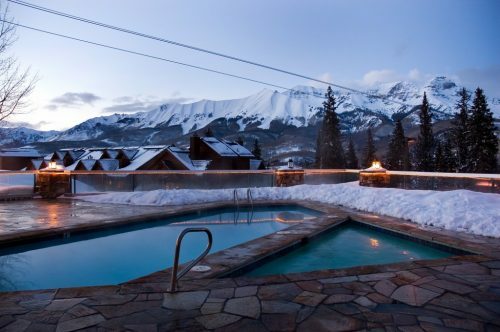 The area around Telluride is also home to a number of hot springs. Head to one of these natural wonders for the day for some extra pampering or stop by to soothe your body and mind after a day skiing. How Does Mountain Lodge Telluride Help Groups? This group-friendly lodge offers a range of accommodations and activities for groups. 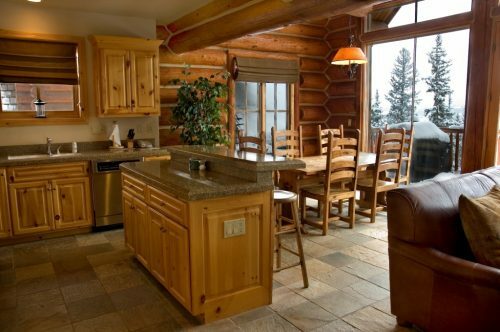 Booking a stay in one of the mountain cabins is a great way to be close to the people you’re traveling with without living in each others’ pockets. While on your trip, if you need something – such as group activity discounts – you can count on the help of the concierge service, which makes planning just that little bit easier. 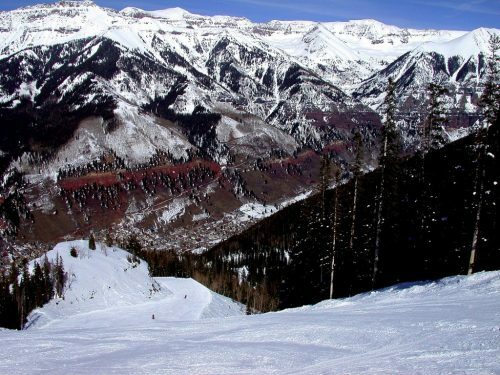 Booking a group trip can often be difficult when you have to cater to so many tastes, but Mountain Lodge Telluride is the kind of place that can keep everyone happy as there’s plenty of skiable terrain and a whole host of other activities to try out. If you want this kind of variety from your ski vacation, Telluride is definitely for you. To find out more, get in touch below. We’d love to hear about your experiences at this luxury mountain lodge so if you’ve visited before, leave a comment. If you’ve found this article helpful, please share it, too.